Charging bison and dancing horses, swirling spirals and shamans in the spirit world: trance images, pecked and painted onto living rock by generations of hunter-gatherers, herders and farmers. Whatever its meaning when the earth was young, rock art speaks to us now of a time when people lived their lives close to nature, in tune with the rhythm of the earth. It is no coincidence that most rock art is associated with what we think of today as wilderness areas, the far reaches of temporal and spiritual existence, wild landscapes where the past is still visible in the present, where what is most special has to do with the way we respond to nature. For twenty years Tony Hopkins has filled sketchbooks with his impressions of the world’s wild places and their secret rock art sites. This collection of paintings is his way of reaffirming the connection between people and their natural environment: art gifted to the elements, gathered from the wilderness. 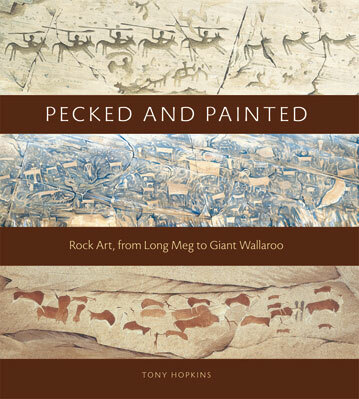 In this beautiful book he brings to life the ancient art of our early ancestors as they portrayed charging bison and dancing horses through images pecked and painted onto living rocks……A fascinating and informative book giving a unique insight into early human imagination.